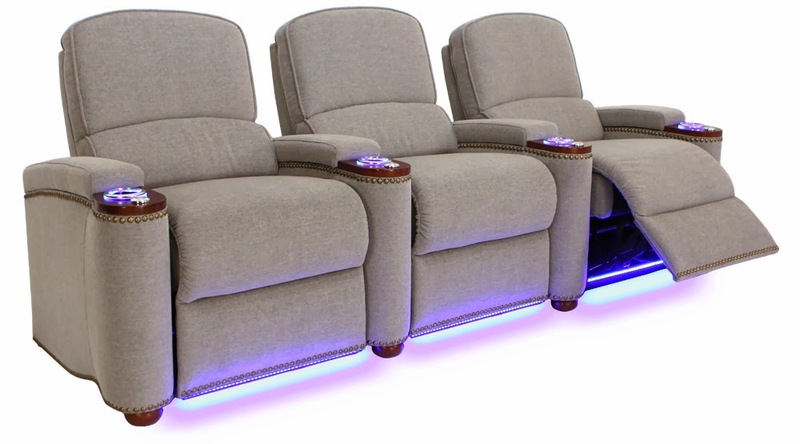 4seating is pleased to announce the arrival of The Monroe, a fantastic new home theater seat in Seatcraft’s acclaimed Signature series. This chair radiates a smooth, unpretentious sense of laid-back natural grace, combined with several unique accents that lend it just the right touch of character. At first glance, the Monroe appears as a typically pleasing, smooth-grey theater chair with wide, roomy backrests. Its fabric material is soft and inviting, making you feel right at home. Look closer, however, and you’ll see several delightful additions that provide a colorful yet perfectly understated contrast. The lower armrest portion of the seat, where the cup holders and accessory mount are located, is outfitted with a polished wooden finish that imparts a naturalistic sense of class. The wooden look is extended to the feet of the chair, once again providing just a dash of rich brown tone to the overall grey. This superb mixture is enhanced by an impressive nailhead design which wraps around each armrest and around the base of the seat, giving the Monroe a chic outline that will put anyone in the right theater-going mood. Moving back to the armrest itself, we find lighted cup holders that keep drinks within a secure arm’s reach. Make spills a thing of the past with the holder’s firm positioning, which is surrounded by a gorgeous sky-blue ambient ring that will discreetly outline your drink in a darkened room. Meanwhile, ambient base lighting does the same thing for the chair itself, its marquee accent allowing for easy access in the dark. Stainless steel accessory mounts on the armrest allow for the placement of iPad mounts, wine glass caddies, cigar hosts and more. One accessory, free black tray tables, comes freely included with the Monroe so you can place food, remotes, laptops, reading materials, or anything else needed for a stellar evening of entertainment. When finished for the night, simply place any items within the convenient, roomy storage compartments located within each armrest—you can clean up quickly and easily, without having to leave your seat! Looking beyond its many features, the Monroe is also primarily about comfort. The wide back sections are abetted by an exceptionally plush and supportive seating, while a full chaiselounger footrest extends the range of leisure to the lower body and feet. 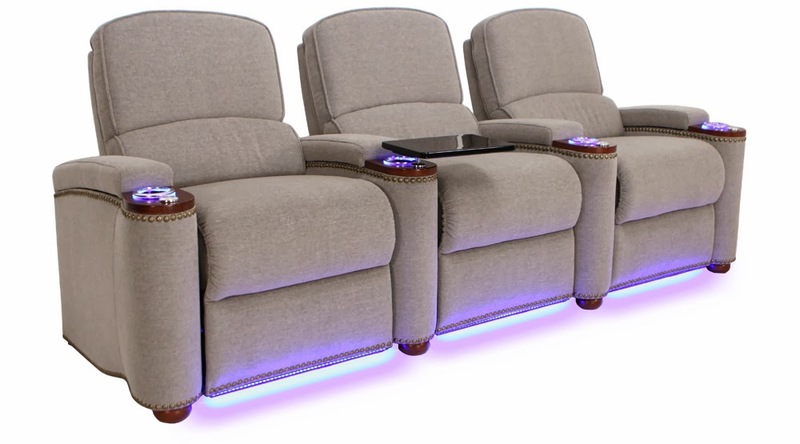 So sit back, relax, and sink in with this charming addition to your home theater.